HARRISBURG, Pennsylvania, February 13, 2012 (ENS) – Natural gas production company Chesapeake Appalachia LLC has been fined a total of $565,000 in civil penalties and reimbursement costs by the state of Pennsylvania for an April 2011 fracking well control incident, for erosion and sediment control violations and for wetland encroachment violations. The Pennsylvania Department of Environmental Protection determined that Chesapeake’s actions constituted violations of the Oil and Gas Act, Clean Streams Law and the Dam Safety and Encroachments Act. Chesapeake paid $190,000 as part of a legal settlement after the operator lost control of a well head during hydraulic fracturing of the Atgas 2H Well in Leroy Township, Bradford County, on April 19, 2011. Fluids from the well mixed with rainwater entered a nearby unnamed tributary to Towanda Creek and Towanda Creek itself. 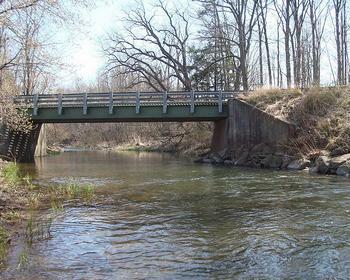 On April 20, 2011, the Pennsylvania Department of Environmental Protection detected levels of total dissolved solids, chlorides and barium that were higher than background levels at the mouth of the tributary, where it enters Towanda Creek. Testing further downstream and on the following days showed these levels returned to normal background levels. Chesapeake Appalachia took two days to stop the flow from the Bradford County well and four days beyond that to bring the well fully under control. At the DEP’s request, Chesapeake suspended completion activities at well sites across the state for three weeks while assessing its equipment’s integrity, containment mechanisms and procedures. Chesapeake’s payment includes a $67,000 reimbursement for costs associated with the agency’s response. The company must also conduct further testing, using an independent laboratory, of five groundwater monitoring wells from the surrounding area to ensure there were no impacts to groundwater from the release. Samples of the five monitoring wells taken in July, August and October 2011 showed levels consistent with regional groundwater quality. DEP fined Chesapeake $215,000 for a March 2011 incident in West Branch Township, Potter County, where sediment was discharged into a stream classified as high quality. High-quality streams receive some of the highest levels of protection in the state, and operators are expected to ensure their work does not negatively affect them. In late February and early March, heavy rain caused erosion to an access road and Chesapeake’s Beech Flats gas well pad, both of which lacked sufficient controls in place to prevent the runoff. As a result, large amounts of sediment entered the Right Branch of Wetmore Run, a high-quality stream. The sediment traveled downstream and impacted Galeton Borough Authority’s water treatment filters. Chesapeake has since paid $190,000 to the authority to repair and upgrade the water supply facility and has made assurances it will reimburse the authority any additional costs associated with this incident. DEP issued a compliance order that required Chesapeake to cease all activity at the site that would disturb earth, such as road maintenance and grading; movement of rock, soil or earth; and activity associated with gas drilling and extraction. Chesapeake was also ordered to implement additional measures designed to lessen environmental impact and submit a revised erosion and sediment control plan. Soon after that, the company installed silt fences, silt socks, gravel surfacing of the access road and a stormwater capture ditch, and it submitted the revised plan. Follow-up inspections determined that the violations were corrected. In connection with a third site, DEP fined Chesapeake $160,000 as part of a settlement resulting from violations in 2010 of impacting a wetland and allowing sediment to enter Sugar Creek in North Towanda Township, Bradford County. Part of a well pad was built in the wetland. It was constructed with extremely high, steep slopes which, after precipitation, caused additional sediment to slide further into the wetland and the nearby stream. A series of site inspections in July 2010 found that the well pad had been constructed partially in a wetland and the construction activities deviated from the site’s erosion and sediment control plan. By constructing the well pad that way, the company filled a third of an acre of wetlands without authorization. There were additional temporary impacts to the wetland through erosion and tree clearing and in October 2010, heavy rains caused part of the pad’s fill slope to fail and sediment to enter Sugar Creek and an unnamed tributary, and impact the nearby forested wetland. In addition to paying the penalty, the company has removed the fill from the impacted wetland and must construct 2.55 acres of replacement wetlands. The company is also required to submit regular, detailed wetlands restoration monitoring reports.